We are funeral directors in Dumfries, and we have provided respectful funeral services to our community for many years. Our funeral professionals will carry out every detail of your loved one's farewell with the utmost attention to detail, and our compassion and understanding will help see you through this difficult time. You can rest assured that your loved one is tended to with dignity and kindness when they are in our care. For larger funerals, we have a service room that holds up to 120 people. Please call us to find out more about our services and funeral home. 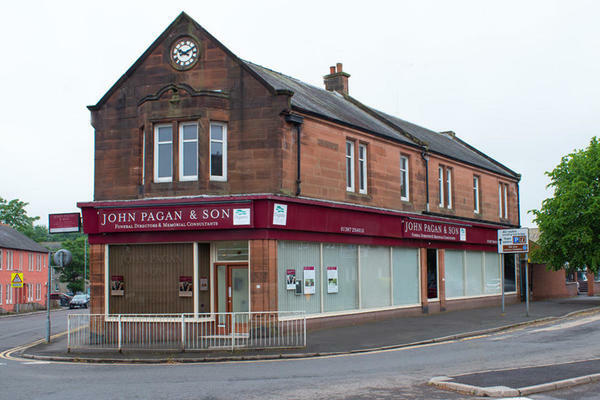 John Pagan Funeral Directors in Dumfries have provided respectful funeral services to our community for many years. We work closely with the families in our care to plan every detail of the funeral, before making arrangements on their behalf. </br></br> We are renowned for our kindness, compassion and respect. You can rest assured that your loved one will be looked after by professionals in our premium facilities. Please call us as soon as you need our help, we are available by telephone 24 hours a day. You can reach us on 01387 254016 at any time. We are on the corner of Annan Road and Brooms Road at the roundabout. Our staff are available 24 hours a day on 01387 254016 if you require our services outside of these hours.